This is a really colourful salad which is impressive for when you have guests or for yourself at home. You can take away or add different ingredients depending on what you have available or what’s in season where you live, but for me this was inspired by the colour that emerges when Spring arrives 🙂 Hope you enjoy it! 1. 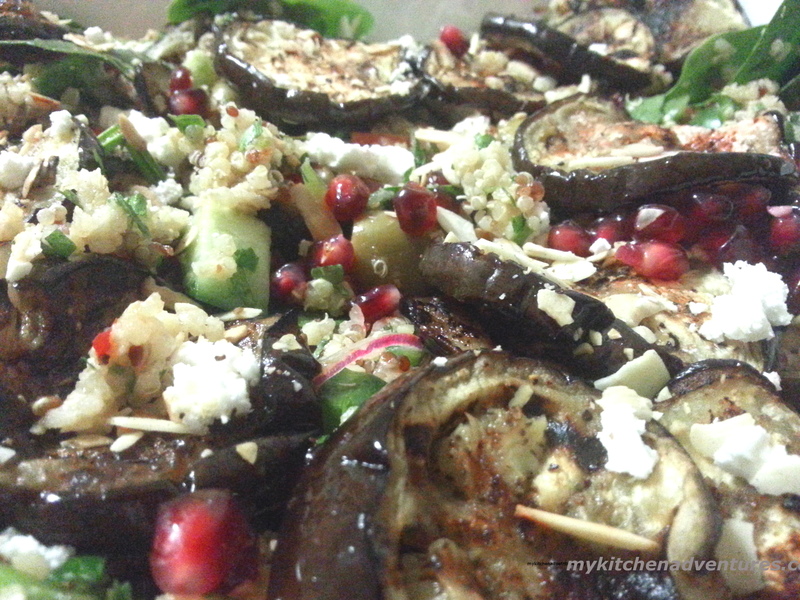 Cut Aubergine into discs 0.5cm thick and sprinkle with salt and cumin and then place on a hot griddle pan/frying pan lined with olive oil. Turn often and cook on pan until brown and softened. Keep aside. 2. Finely slice the spring onions, red chilli and cut the tomatoes and cucumber into small cubes. Mix these together in a large bowl with 1/2 teaspoon salt & pepper and keep aside. 3. Cook the quinoa and then add the cut vegetables to the cooked quinoa along with chopped parsley & mint & lemon zest & juice. Mix well, check the seasoning and place in your serving dish. 4. 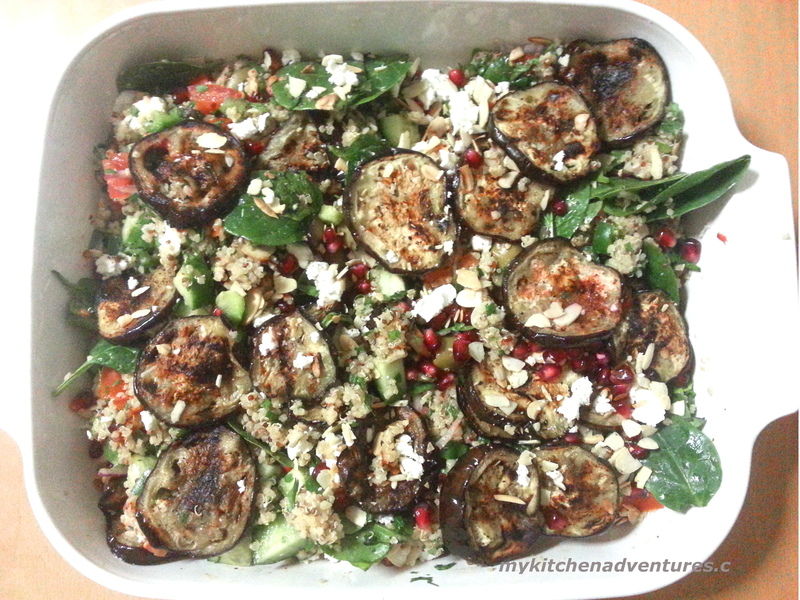 Dice or crumble the feta onto your quinoa tabbouleh mixture, then add the aubergine and toasted pine nuts. Finally strew the pomegranate over the top and serve. Looks very colourful, I am going to try this.. How many servings does this give? Thank you! 🙂 If you’re eating this as s main meal then it’s plenty for 2 – 3 people. Otherwise it would serve 4 – 5 people as a side dish. I made a version of this today and thoroughly enjoyed it! I made a few changes just because I didn’t have all the ingredients to hand! I added some courgettes to the griddle and used coriander instead because I had forgotten the parsley and mint! I also added some avocado because they were very ripe and I needed to use them up! But I must say I enjoyed every bite and will definitely try this again! Thanks so much!